Minister of the Interior Katri Raik appointed today the current Vice-Rector of Development and Innovation Marek Link as the new Rector of Estonian Academy of Security Sciences(EASS). Marek Link has worked at EASS since 2008 – in the past 3.5 years as the Vice-Rector of Development and Innovation, before that as the head of the Police College training centre and the Centre for Innovative Learning Technologies. Link received the Most Innovative Lecturer Award at EASS in 2015, the silver cross of merit of EASS in 2013 and he was selected the Colleague of the Year in 2012. Minister of Interior, Katri Raik, said in her interview that she has been Marek’s colleague. She shares Mareks’ conviction of the importance of student-centred education, the need for improving teaching methodology and international cooperation. “Marek will begin his mission at an enviable time – the new building of the Academy of Security Sciences is about to be opened providing them with a number of new opportunities. Our internal security institutions need new people and not only among youngsters. This, in turn, means that the instruction in the field of internal security must be considerably more flexible and innovative,” the Minister of the Interior Katri Raik stated. 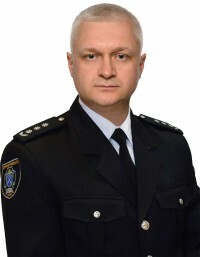 According to Marek Link, the career of many employees working in the field of internal security begins at the Estonian Academy of Security Sciences, and it is therefore important that the acquired education provides them with not only professional skills and knowledge but also with broadened horizons and entrepreneurship. “Irrespective of the speciality, it is clear that security can only be established in cooperation and it starts from all of us. And EASS has an important role to play in this,” Link remarked. The Academy of Security Sciences is a unique educational institution in the world, as the instruction in the field of internal security of the entire country is conducted in one organisation. Similarly, it is possible to acquire education on vocational and professional higher education level as well as in Master’s studies. The mission of EASS is to teach how to ensure security and live safely. The work of EASS is conducted in various places in Estonia – in Tallinn, Paikuse, Väike-Maarja, Muraste and soon also in Narva where we will have a new practise centre. The Academy employs more than 200 people and teaches around 1000 students providing education in customs and taxation, corrections, police, rescue and emergency response service. Peter Lamplot, Secretary General of the AEPC and Mario Krebs, AEPC Secretariat and Austrian National Contact Point for RAN Pol, gave a presentation on the AEPC initiative „Prevention of Radicalization“. From October 2017 until September 2018 four Workshops with more then 50 participants from eleven countries were conducted. Due to that initiative nine new projects were elaborated and some are already implemented. Until the Executive Committee meeting would launch on 7th of November, the leadership staff of the Educational Complex visited the Armenian Genocide museum-Institute. 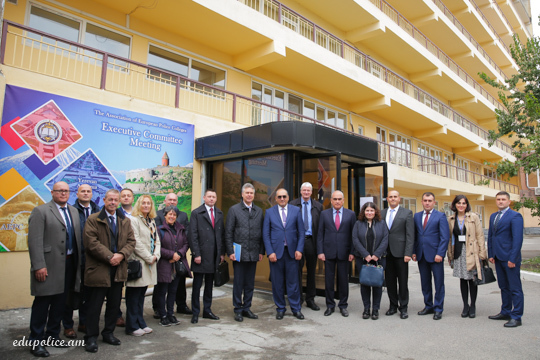 Afterwards, the guests arrived to the Police Educational Complex of RA, they were met officially by the leadership staff, managed by the head of the Educational Complex, Police Major General Mushegh Babayan. This September the AEPC has got a new member. During the Governing Board Meeting in Baku/Azerbaijan, Dnipropetrovsk State University/Ukraine signed the Memorandum of Understanding and became the 55th member. Welcome in the AEPC family! Detailed Information about Dnipropetrovsk State University is abailable on our Website „Academy of the Month“. Born on April 16, 1972 in the town of Rudny, Kustanai Oblast, the Republic of Kazakhstan. Married, one daughter. In 1994 graduated from Poltava Higher Military Command School of Communications. From 1994 to 1996 he served in the Armed Forces. In 2005 he graduated from Lugansk Academy of Internal Affairs. Specialized in “Jurisprudence”. In January 2016 he has been appointed to the position of Vice-Rector of Dnipropetrovsk State University of Internal Affairs, since October 2017 – Rector of Dnipropetrovsk State University of Internal Affairs. For exemplary performance of his call of duty, contribution into national security, by the Decree of Ukraine President, Mr. Andrii Fomenko was awarded Order “For Merit” of 3-rd Class. Also awarded with Ukrainian MIA excellence badges „For Excellent Service“ 1-st and 2-nd Class, «For safety of nation» 1-st and 2-nd Class, «Honorary Badge of the Ministry of Internal Affairs of Ukraine», «Law and Honor», as well as medals: «For valor» 2-nd Class, «For services in fighting the crime» 2-nd and 3-rd Class. In 2017, Andrii Fomenko was granted the degree of Candidate of Legal Science. By Decree of the President of Ukraine on 01.12.2018 No. 404/2018 was awarded the title Honored Lawyer of Ukraine. His military rank: Police Colonel.